A lovely drive north on the Olympic Peninsula will take you to the gorgeous seaside town of Port Townsend, WA. Port Townsend is the perfect getaway for lovers of Victorian architecture and all things nautical. It’s also a fantastic spot for some tasty beer. But first, a short history lesson. downtown area and amazing Victorian homes (AKA “painted ladies”) peer down from the cliffs just behind the main street. You can stay in one of the historic hotels located on the main street or you can do what hubby and I did and stay just a few blocks away at Manresa Castle. 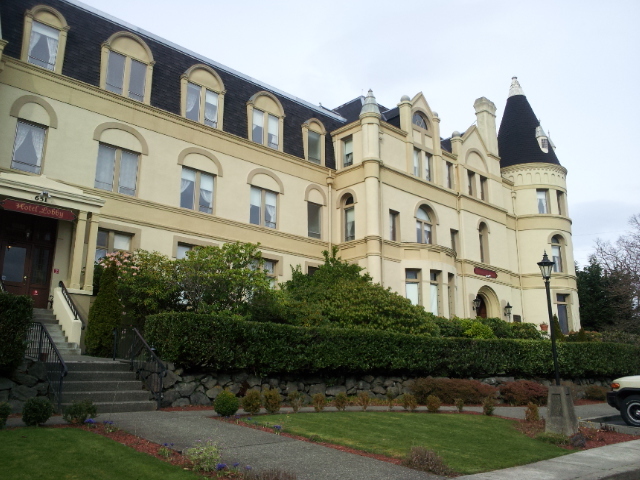 Yes, there is a castle in Port Townsend! Built in 1892, it was the hill-top home of Port Townsend’s first mayor and his wife: Charles and Kate Eisenbeis. Jesuit priests bought the home in 1927 and used it as a training college. Today it is a hotel lovingly restored and gorgeously decorated in period antiques and photos of Port Townsend’s past. One can’t help but want to explore every nook and cranny of the grand old house. As with most old structures, Manresa Castle is rumored to be haunted. I was so looking forward to encountering a spirit. Alas, not this time. 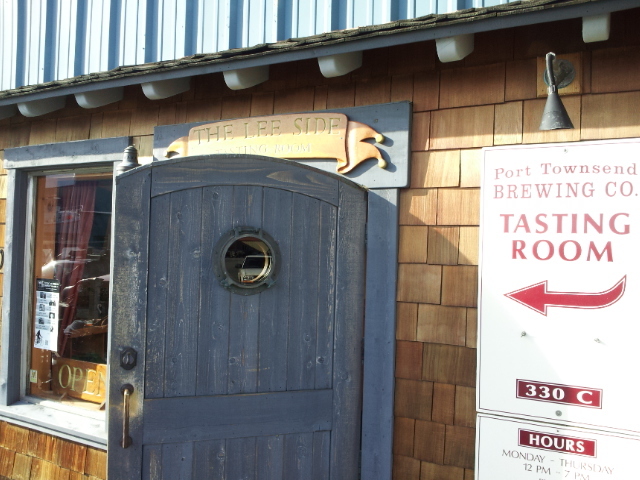 Just down the hill in the ship yard sits Port Townsend Brewing Company. Opened in 1997, the brewery has become the pride of the town. And it’s no wonder why! The tasting room is very large and quite elegant. And boy do they have a lot of beer. I enjoyed the taster tray but was a bit overwhelmed by the amount of beer served; twelve tasters on the tray! Instead of describing every one of them I will pick out my favorites. Chet’s Gold (4.3% ABV) – the lightest beer in the joint. Very crisp, light hops, slightly sweet and finishes clean. Great for a hot day. Bitter End IPA (6% ABV) – Gold color. Hoppy aroma and full body hop character. Grapefruit notes all the way through. Very tasty. Hop Diggity IPA (6% ABV) – For an IPA this popular beer has a malty body. Hoppy but easy for the beginning IPA drinker to enjoy. Lovely grapefruit finish. Planet Zythos Pale (6.8% ABV) – Unfiltered, hoppy, and well-balanced. Another great beer for the beginner to give a try, but the enthusiast will enjoy as well. Straight Stout (6% ABV) – For the chocolate fans, this one’s for you! Ink black color and light tan head. Chocolate aroma with smooth, chocolate, malty body and finish. It was very hard to choose just a few of Port Townsend Brewing’s beers to talk about because they were all great. The tasting room is open Tuesday through Saturday. During warmer weather they open the grassy beer garden and feature live music. describe Sirens as a mix of gypsy den and antique store. There is outside seating and a gorgeous view of the Puget Sound. Sirens has a great beer selection (11 brews on tap and various bottled beers) and the food in incredible. The staff is very friendly and there is live music on occasion so be sure and check their schedule. 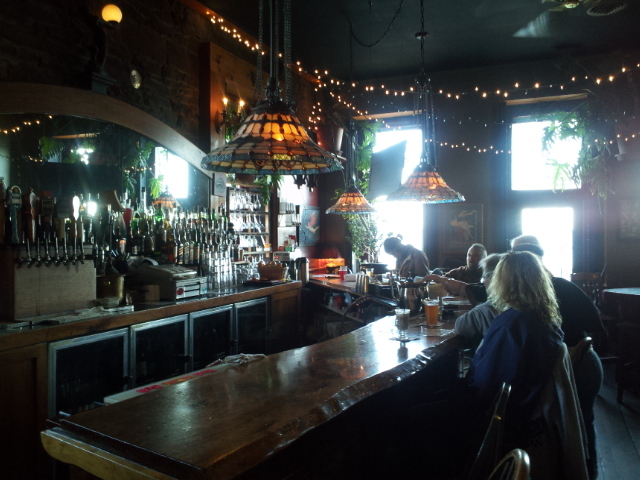 Port Townsend is a town full of maritime and Victorian history. Great for an overnight stay or a romantic weekend getaway, I would suggest anyone to stop through at least once. There aren’t too many towns like this left!